The new HSM SECURIO C18 CC-4 is a 1.9x15mm Micro Cut shredder and is an extremely powerful personal or home office model designed for 1 to 3 users. This very quiet and stylish machine is also capable of shredding credit or store cards. A unique multi-function operating button controls the machine, including the forward and reverse operations. 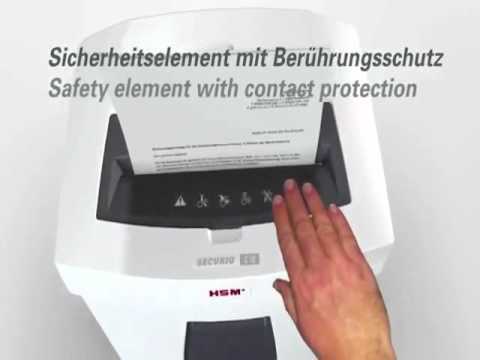 The HSM SECURIO C18 CC-4 shredder automatically starts, stops and reverses in the event of a paper jam. It also saves valuable energy by turning off when not in use via an efficient energy management system called eMcS. The HSM SECURIO C18 CC-4 also features a folding safety element with contact protection that stops the device when pressure is applied to the entry throat, plus a removable waste container which automatically stops the machine when the shredded material is removed. The machine will stop when the shredded paper reaches a certain level, which can also be viewed through an inspection window. Made to an extremely high quality construction design, the machine is manufactured in Germany. The use of a P-5 shredder such as the SECURIO C18 CC-4 will aid your GDPR compliance.